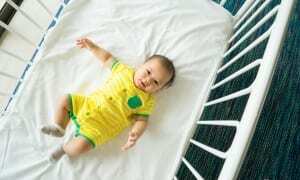 How To Buy The Best Baby Bouncer - Which? Baby bouncers can soothe, entertain or keep your baby out of harms way if you can't hold them. Find out how to choose the best. How much do I need to spend on a baby bouncer or rocker? You can find a baby bouncer for as little as £15 for a basic version, up to £100 or more for a top-of-the-range model with vibrations and lullabies. There are two main types of baby bouncer. Baby door bouncer: a fabric harness attached to some bungee-type cords and a frame that attaches to a door frame so your baby can bounce about. We asked 1,439 parents about their experiences of using a baby bouncer to help you spend your money wisely on the very best brands. Visit our guide to the best and worst baby bouncer brands to see which brand is worth spending your money on. Not a Which? member? You can unlock all our ratings and reviews, from pushchairs to vacuum cleaners, with a £1 trial subscription to Which?. Bouncer or rocker chairs can be simple, with just a few toys attached, or they can be more elaborate – some have a built-in rocking motion or vibration, or even music, to help soothe your baby to sleep. Just remember that if you go for a type like this, you'll need to use batteries, or get one that plugs in. You can also get ones that have a number of recline positions, and that can transform into a toddler seat when your child is older. At what age can my baby use a bouncer chair? Bouncer chairs are for young babies – many are suitable from birth – enabling your little one to lightly bounce while they kick and move around. You can use a rocker chair only until your baby is around six months old, can sit up independently or weighs about 25lb, but always check the instructions that come with your chair. With a door bouncer, your baby sits in a special seat that's attached to a long elasticated strip, the top of which is clamped to the door frame. The baby pushes against the floor with his or her feet, and bounces up and down. You can get fabric or plastic door bouncers, costing between £15 and £70, and some have a small shelf with toys attached. The bouncing sensation can delight babies – and be hilarious to watch. This will probably be the first time your baby has felt the thrill of being able to move fast using his or her own leg muscles. However, even babies who love bouncers may tire of them after 10 minutes or so, and you should keep sessions fairly brief – 15 minutes is fine, 30 minutes the absolute limit. When it comes to using a door bouncer, make sure your door frames and doorways are suitable for it. Narrow doorways aren't particularly suitable because your baby will bounce sideways as well as up and down, so he or she could knock against the frame. Ensure the bouncer doesn't slide sideways as the baby is using it. At what age can my baby use a door bouncer? Door bouncers can be used from about five to six months of age – as soon as your baby can support his or her head. If you can't decide which type of bouncer you want, it's worth looking at parents' ratings of the most and least useful baby products – a door bouncer comes in at number one as the least useful baby product, and a baby rocker chair is number nine on the list of most useful baby products. To avoid wasting money on baby equipment you don't need, check out our handy guide to essential baby products. Can I buy a second-hand baby bouncer chair or rocker? Yes. If you're buying a baby bouncer second-hand, make sure you check its condition – look particularly for cracks or weaknesses – and check it's not a recalled product by visiting the Trading Standards website. If you're interested in buying second-hand baby equipment, look at our guide to second-hand baby equipment to ensure you make the right checks. Whichever type of baby bouncer you choose, the frame must be sturdy and solid, as it will need to take the weight of your baby. Make sure you check the minimum and maximum weights on the bouncer, and don't exceed them. You should also make sure there is plenty of room for your baby to bounce; for example, if it's a door bouncer, check that the cord isn't too long to avoid your baby hitting the floor. If it's a rocker, make sure there is enough room between your baby and the floor. The bouncer must also have at least a three-point harness – preferably a five-point one - to stop your baby from falling out. Look for the BS EN 14036:2003 safety mark on the baby bouncer you buy, indicating that the product complies with the appropriate safety standards. Never place a rocker chair on a raised or soft surface, such as your bed, in case your baby makes it move enough for it to drop off the edge, or tip over and suffocate them. Keep an eye on your little one, and make sure the bouncer is well away from hazards, such as heaters or wires. 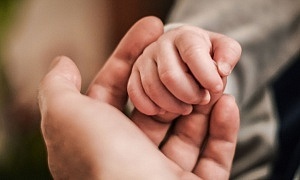 Essential baby safety equipment – find out what you need to invest in.